A few things distinguish the Japanese distance running scene from its counterparts around the world. As I enter my final week in Tokyo, I’ll summarize some of the major differences I’ve discovered in this country’s approach to the sport. First of all, road running in Japan is somewhat of a national pastime, not too unlike that in the East African countries but without the dynamic of poverty and desperation at play. As another example, in the U.S., you typically have to pay money to steam a major marathon like Boston or New York on your computer. In contrast, getting excited about distance running doesn’t require a concerted effort in Japan; marathons and road races are broadcast on live television for up to seven or eight hours, and attract a large enough fan base to justify it. 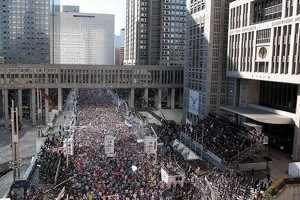 The Tokyo Marathon has become so massive and competitive that next year, it will join Berlin, Boston, Chicago, Berlin and London as the sixth World Marathon Major. Based on the number of applicants for this year’s race– 304,540 for the full marathon and an oversubscription rate of 10.3– it’s safe to say that Tokyo is well on its way to hosting one of the most competitive marathons in the world. In fact, that’s the goal! Tokyo is also one of six cities bidding to host the 2020 Olympics, along with Baku, Azerbaijan; Doha, Qatar; Istanbul, Turkey; Madrid, Spain; and Rome, Italy. The decision will be made this September so keep your eyes peeled! Sorry– couldn’t help myself. And Google delivered. 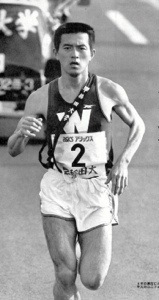 If you consider the highest values and ideals in Japan, it’s not surprising that distance running totally thrives here. Brendan Reilly put it nicely when he wrote, “The very nature of long-distance running resonates with the Japanese spirit. Endurance, perseverance, and the will to never-give-up-no-matter-how-damn-uncomfortable-it-gets are core Japanese values. 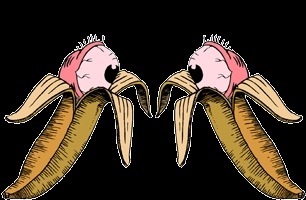 A popular proverb is Nana-korobi, ya-oki (Fall down seven times, get up eight times.) One of the highest compliments that can be paid to an athlete is to say that he or has makenki, roughly translated as ‘the spirit not to lose. '” Makenki can be compared to “guts” in the United States and “sisu” in Finland (which I can tell you more about come June), and is taken to the extreme in Japanese athletic competitions. Nowehere is the makenki spirit more evident than in the ekiden. The tradition of that discipline began in 1917 as a commemoration of the movement of the Japanese capital from Kyoto to Tokyo, and was staged in a 3-day event between the two. Now, every winter, Japanese and international runners and astounding numbers of interested, ordinary citizens celebrate the sport during a series of fiercely competitive long distance road relays. There’s no uniform distance or number of legs of an ekiden, as each one has developed its own course and personality. The National High School Ekidens, for example, are composed of half-marathon legs for women and full marathons for men, while the New Year Ekiden features 7-person teams running stages between 8.3 and 22.0 kilometers to cover a total race distance of 100.0 km. The common thread among the various ekidens is the wild enthusiasm, public support, and extreme competitiveness that pulses through the country during ekiden season. Each one is a dramatic defense of one’s loyalty and the tasuki, or sacred sash that also serves as a baton, symbolizes years’ worth of every team member’s training, setbacks, sacrifices, and dreams. 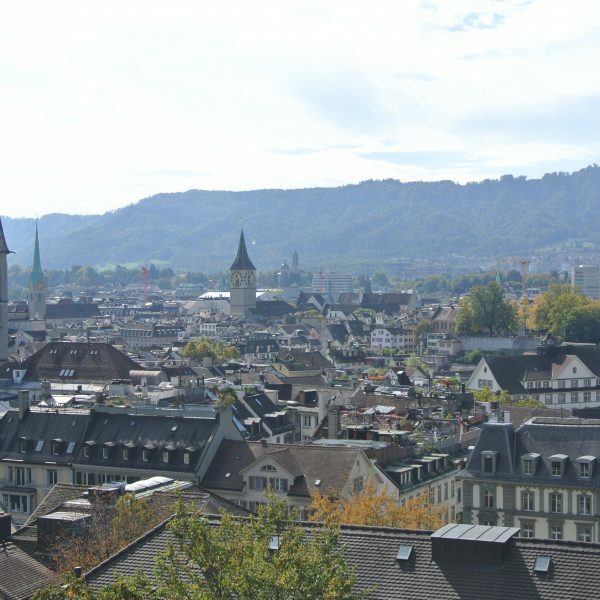 High school, university, and professional teams are so serious about putting together the most competitive relay possible that, like many NCAA recruiters, they venture overseas to extract the best runners they can find (although there are now restrictions as to the number of foreigners on each roster). Remember Sammy Wanjiru, the Beijing Olympic Marathon Champion from Kenya who died from a tragic balcony fall (or suicide) in 2011? 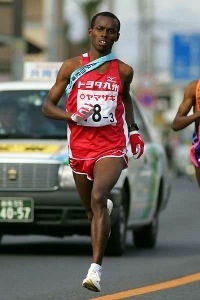 He achieved his big international breakthrough while running for Sendai Ikuei High School, during which he set a stage record (22:40 for 8.1 km) at the 2004 National High School Ekiden Championships and led his team to the team course record along the way. Some people speculate that the raging emphasis on the ekidens– largely an internal competition– is responsible for the surprising lack of elite Japanese runners on major international podiums. Whether that’s true or not, these races garner efforts bordering on masochistic as well as unbridled public enthusiasm for distance running comparable to few, if any, athletics events in the world. From the perspective of a country where distance running is a very niche and off-the-radar sport, it’s hard to see the fault in that. Another difference in the Japanese running world is the heavy involvement of corporations. While it’s rare for an American runner to receive sponsorship from non-running stores or brands, Japanese runners are financially supported and employed by companies ranging from department stores and automakers to cosmetic makers and even a lingerie shop. Once an athlete is selected for membership to a team, he or she is given nearly every resource imaginable to succeed as a runner: housing, food, stipends, coaches, nutritionists, physical therapists, and a very rigid schedule. Typically the teams meet for a morning run, put in a half day’s work at the corporate sponsor’s office, and meet again in the afternoon for the main workout. In addition, they attend regular gasshuku (training) camps in other areas of Japan and abroad. > Volume: The staple of most runners, both males and females, is high mileage. It’s not uncommon for female marathoners to put in 60k (37 mile) long runs, or male marathoners to run weekly volumes over 200 miles. 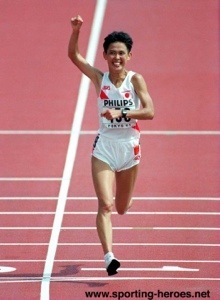 As an example, Yuko Arimori (pictured below), a woman who won silver and bronze medals in 2 Olympic marathons, ran 750 miles per month (averaging a marathon a day) during heavy training blocks and once did two 20-kilometer time trials in a single day. > Marathon-orientation: Along the same lines, the marathon is the pinnacle of distance events here. So much so, in fact, that relative to its depth of world-class marathoners, Japan produces shockingly few middle distance runners. Some coaches are beginning to share the focus with shorter distance events, but I imagine that it will take a good while to stray from the deeply-ingrained marathon fixation. > True easy days: Japanese runners are the champions of recovery runs. While they’re able to take their bodies to very dark places during workouts, they’re also able to back off tremendously on designated easy days. Even the best of the best distance runners aren’t above an 8- or 9-minute plod, subscribing to the belief that time spent on one’s legs is productive despite the pace (a very different camp from many American runners who avoid “junk miles” that they fear tire their legs out without much aerobic benefit). > Monotony and mental strength: Loop courses are another major component of Japanese distance training. Whether they were created out of necessity due to populous cities and limited running space, or with the purpose of mental-sharpening and pace-mastering, long runs consisting of multiple short loops are regular features of many distance runners. Toshihiko Seko, 2-time Olympic marathoner and former world record holder, famously did many long runs around Yoyogi Park (which I’ve run around and haven’t found a circuit longer than 2 miles). Oh, and in addition to running 200-300 mile weeks regularly, Seko ran one 630 mile week (nope, not a typo; that’s six-hundred and thirty miles in a week, or ninety miles a day). Jim– what do you think? Should we go for it?! 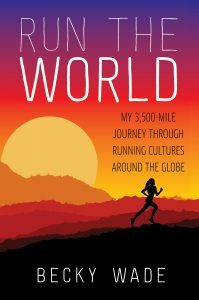 If you’re interested in learning more about these and other distinctly-Japanese elements of distance running, take a look at Brendan Reilly’s Where the Marathon Matters article from Runner’s World or Japan Running News, an amazingly comprehensive site run by Namban Rengo runner Brett Larner. 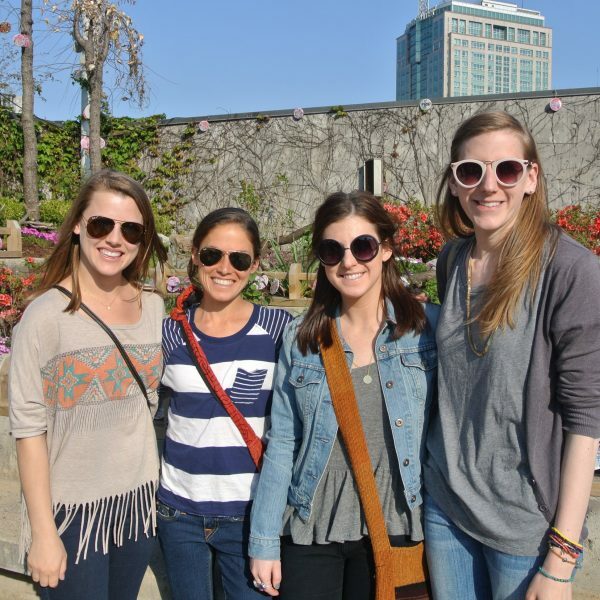 And if you’re still intrigued, jet-set on over and see what it’s all about! Since I’m in Japan out of ekiden season, I definitely plan to come back to see some in action. Better yet, why not stockpile some makenki and get in the mix?